There is an old song that goes like this: “If I knew you were coming I’d have baked a cake.” But who wants to do that in steamy weather? 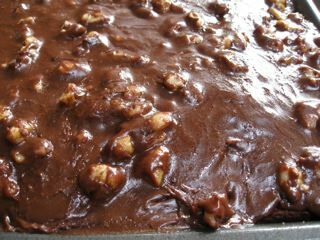 Well here is an easy to make sheet cake that will take only 20 minutes to bake. It serves a crowd and is delicious. 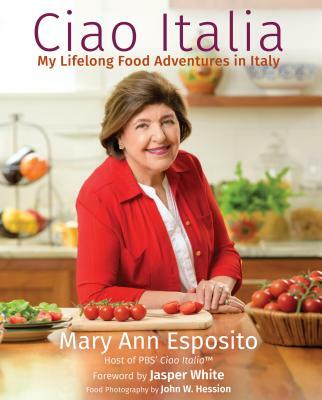 I took my inspiration for it from Texas, yep, lots of Italian Americans there, especially in Dallas. 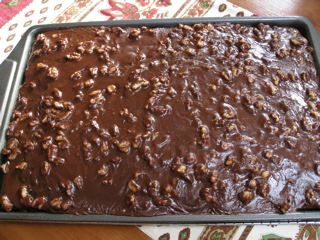 So here’s my version of Texas sheet cake; I call it Tex-Italian chocolate sheet cake. In a large bowl combine the flour, sugar, baking soda, salt and cinnamon. Beat in the mascarpone cheese, eggs and vanilla until well blended. The batter will be thick. Set aside. In a saucepan melt the butter over medium low heat. Add the water and cocoa powder and stir until smooth and the mixture just begins to boil. Take the mixture off the heat and pour into the batter. Use a hand held mixer to blend the mixture until smooth. Pour the batter into the prepared pan and bake for 20 minutes or until firm to the touch. Remove from oven and place the cake on a cooling rack. Combine the milk and cocoa in a 2 quart saucepan; stir well to combine and just bring to a boil. Take the mixture off the heat and with a hand held mixer beat in the confectioner sugar and vanilla extract. Fold in the nuts. Pour the frosting over the warm cake and carefully spread it with an offset spatula evenly over the cake. Let the cake come to room temperature then cut into squares. Ever tried this cake with a caramel icing?? YUM.